Q: Do you have a menu that allows the sub-items to 'slide' out from the menu? For example, you mouse-over the first button, and the sub menu slides from 'underneath' the button from left to right? A: You should to use transitional effects. But notice that transitional effects are features of Internet Explorer5.5+ only. Q: How does an item on the dhtml navigation menus connect to pages? Does it take the page's name automatically? If I add a page, will the menu item show the new page? If I remove a page, will the menu remove the item? A: > how does an item on the menu connect to pages? > does it take the page's name automatically? > if I add a page, will the menu item show the new page? > If I remove a page, will the menu remove the item? No, you should do it manually in Deluxe Tuner (or any text editor). 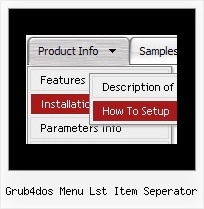 A: You can create such menu with Deluxe Menu. 7 ม.ค. 2009 ... ตรวจสอบไฟล์ /boot/grub/menu.lst ว่าค่า default ..... ipp2p-0.8.2/Makefile:73: ** * missing separator (did you mean TAB instead of 8 spaces? (ou bien cat /etc/boot/grub/menu.lst | grep vmlinuz est-il plus fiable ?) .... kernel=`zenity --title "$title" --list --separator="